You don’t have to be a billionaire real estate developer like Buzz Oates or preside over a chain of supermarkets like Joyce Raley Teel. In fact, the IRS says about $344,000 in adjusted gross income bought membership in the 1 percenters club in 2009, the most recent figure available. In the Sacramento region, a lot of people can cross that threshold without making headlines. Gary Pruitt, recently departed from the McClatchy newspaper chain to run The Associated Press, was pulling down an annual salary of $953,700 when he left. That’s before stock options or other compensation. The trio of vice presidents under Pruitt each earned salaries of roughly $460,000 to $550,000. The most successful of Sacramento’s doctors, lawyers and real estate brokers can easily make the list. Staying in the 1 percent, however, is an altogether different story. According to the Internal Revenue Service, the total income of the 1 percent fell by more than 30 percent between 2007 and 2009. A study by the Federal Reserve shows a third of the people in the nation’s top 1 percent in 2007 were no longer on the list come 2009. As it turns out, the 1 percenters are a risk-taking bunch, prone to lofty presumptions, precarious investments and lavish spending. For help turning income into wealth and preserving it, 1 percenters often consult experts such as financial adviser Larry Hansen at Capital Planning Advisors Inc. in Sacramento. The firm works with investors at all income levels, but the top tier is comprised of what the Securities and Exchange Commission calls “qualified investors.” One of the qualifications is having at least $5 million in liquid, investable wealth. Just below that tier is the “accredited investor,” who must be worth at least $1 million, not including the family home, or have $200,000 in personal income or $300,000 in family income. The level of financial protection available to wealthy folks is generally lower than to the general public, Hansen says. They are presumed to have enough sense to investigate an opportunity before writing a check. But that doesn’t always mean the investments carry higher risk. For instance, a qualified investor can put money in senior secured debt portfolios, essentially lending money to large companies. “They are more secure, typically, than corporate stocks or corporate bonds because they are first-position debt,” he says. In other words, the investor stands at the front of the line to collect in case of bankruptcy. Other investment tools for the wealthy can include tax-deductible oil and gas portfolios, equipment leasing, managed futures and even credit card debt. What wealthy investors give up is liquidity. It’s hard to sell a real estate portfolio for quick cash. Last year, Hansen’s firm saw the opportunity to enter a niche market: offshore wealth management. The IRS has stepped up enforcement of rules governing offshore assets. As a result of complex reporting requirements, many foreign investment opportunities don’t accept U.S.-based investors, says attorney Jeb Burton, whose namesake law firm works with Capital Planning Advisors to set up trusts in the Cayman Islands, Grenadines, Channel Islands and similar places with attractive tax laws. Motivations include having assets beyond the reach of local jurisdictions if the client gets sued or is involved in an accident. Other clients aren’t sure the United States is as economically stable as the government would like us to believe, he says. Some Sacramento clients have made their fortunes in local real estate development and want to continue the practice in new markets, Burton says. Others have gone through a big transition such as a divorce, inheritance or the sale of a business and suddenly find themselves able to make big changes in their portfolios. Offshore investing advice is a relatively new service in Sacramento. Hansen says he doesn’t know of another firm that does it, and Burton could think of only two other attorneys in town who do similar work. But “the level of planning sophistication among the region’s 1 percent is on the uptick,” Hansen says. Agricultural wealth, meanwhile, is a big source of regional clientele, as is clean technology, which has brought in several foreign executives who don’t reap much benefit keeping assets domestically. 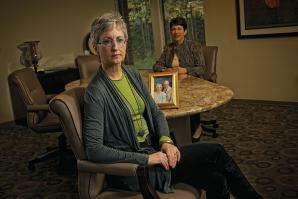 Some of the wealth is multigenerational; some is professional — doctors and lawyers, mostly. About $344,000 in adjusted gross income bought membership in the 1 percenters’ club in 2009. “I would say of the closely held businesses, probably two-thirds are first-generation owners and a third are subsequent owners,” Hansen says of his clients. But not all who enter the gates of the 1 percent shall remain. There are obstacles to overcome — both self-inflicted and unforeseen — along the way. Boyd Cahill has for decades been one of the Capital Region’s top commercial real estate brokers. It’s a commission-based business, so success is directly connected to income. It’s high-risk and high-reward. “The last time I had a salaried job I was flying for the Navy and I was 26 years old,” says Cahill, who turns 69 in August and is still going strong as a principal at TRI Commercial’s office in Roseville. Cahill’s advice: Pay yourself first. Set a portion of earnings aside before buying goodies. For himself, he’s divided his savings into two pots: One is for stocks and bonds selected with the help of a financial adviser; the other is in real estate. The returns from those investments are his “mailbox money.” Without it, he’d have no choice but go back and swing more deals. “And you don’t want to have to make a deal when you are older and your energy level has diminished,” he says. Granted, Cahill has an edge. He puts together real estate deals for a living. He’s a retail specialist, so he’s invested in retail strip centers and single-tenant properties. And yet even the real estate expert has stubbed his investment toe. About 25 years ago he took an uneducated risk, entering a limited partnership on an apartment deal — a type of property Cahill admits to not understanding well. Outside his area of expertise, Cahill and the 1 percent rely on advice from a team of experts that includes financial advisers, a CPA, a business attorney, an estate-planning attorney and sometimes a banker or business consultant. Still, even with the best advice and business acumen, the rich still lose money like anyone else, and many have since the economic collapse. “You’ve seen a lot of wealthy people’s wealth get wiped out, especially real estate investors. I know of a few bankruptcies,” says Steve Zeller of Zeller Kern Wealth Management in Gold River. Many business owners have seen the value of their companies decline. Venture capital and angel investment funds are having a tougher time raising money because the people they court simply don’t have as much wealth to contribute. The National Venture Capital Association reports that the pool of venture money has been shrinking. For each of the past five years, venture funds have been putting more money into companies than they have been able to raise from investors. Last year it was about $28 billion invested but only about $18 billion raised. An old Scottish proverb talks of “shirtsleeves to shirtsleeves in three generations,” hinting that it’s tough to preserve wealth and pass it along from parents to children to grandchildren. The generation that built up the original wealth tends to be the most sensitive about preserving what it has, Zeller says. While individual circumstances differ, he offers a little free advice: “Stay out of debt. In other words, don’t go borrowing money to buy a vacation home or for speculative investments. Pay off the mortgage instead. Lesli Pletcher’s parents were not extravagantly wealthy by any stretch of the imagination. However, true to form of a couple raised during the Great Depression, they were frugal and financially cautious so that, by the end of their lives, they had amassed a substantial estate capable of easily sustaining Pletcher’s father in his $9,000-a-month Alzheimer’s care facility.